Since the demise of eat and the Union Square Bistro, there has been a lack of fine dining establishments in Union Square, which is full of pubs and ethnic eateries. If you wanted creatively prepared cuisine in a pleasant setting, you had to go to (in order of distance) EVOO (now Bergamot), Hungry Mother, or Gargoyles on the Square (Davis Square, that is). When I heard that a new restaurant would be opening just steps away from eat’s old location, I dared to get my hopes up. The chefs and owners, Tsei Wei Lim and his wife Diana Kudayarova, kept the curious updated and built a local buzz with their Facebook and Twitter posts, as well as their website/blog. Even The Boston Globe got in on the act, publishing a multi-part story on the trials and tribulations of opening a new restaurant (part 1, part 2). To make things even more interesting, the restaurant is mere steps away from the Union Square Farmer’s Market, so every week I’d poke my head in to see the progress that had been made in converting a sauce factory into a restaurant. Journeyman finally opened for business last Wednesday. I rarely go to a new restaurant during its opening month, but I wanted to show my support as well as satisfy my curiosity, so She Who Must Be Obeyed and I, along with out neighbors, made a reservation for this past Sunday. 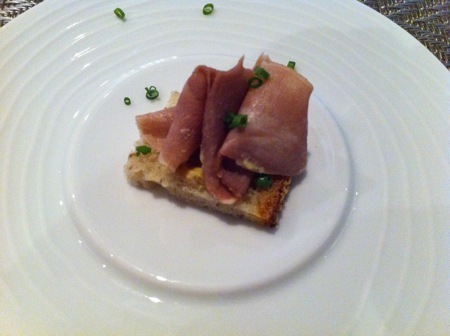 A ribbon of thinly-sliced confited pig’s tongue, served on bread with a dot of mustard, this dish announced the evening’s menu theme. I have run into Tse Wei quite a few times this summer, so when I told him last week that we had a reservation, his response was “I hope you like pork.” Our server explained that the restaurant had procured two heritage breed Tamworth hogs, and named them Lenin and Stalin. (Tamworths have reddish skin and bristles.) We would be eating various bits of Stalin throughout the evening. 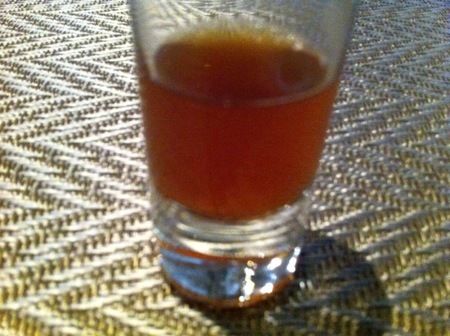 This was a shot of Norwegian Wood by HaandBryggeriet, a beer made with some smoked malt and preserved with juniper rather than hops. I don’t know if it was available from the wine list, but we all agreed we would have happily continued drinking it for the rest of the meal. 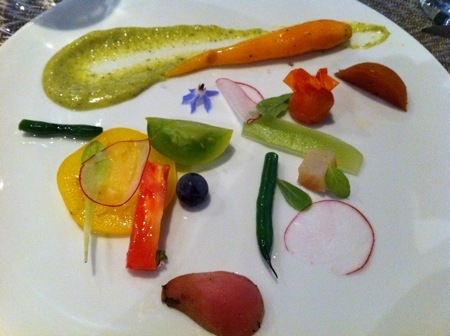 A little of everything: a very pretty plate of carrot, radish, bean, beet, and an assortment of tomatoes, all tied together with buttermilk zucchini dressing. 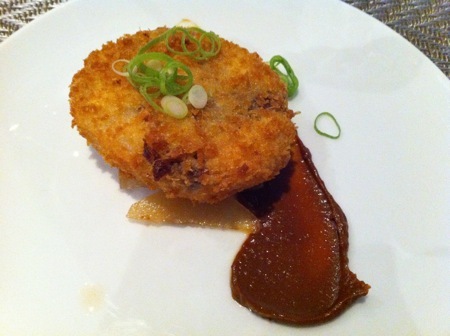 A crispy fried torchon of meat from the pig’s head, served over kimchi-marinated pear slices with a smear of miso butter. I loved the combination of the fatty pork with the Asian flavors and a hint of heat from the kimchi. This is the kind of dish I’d expect to find on the menu at Momofuku. 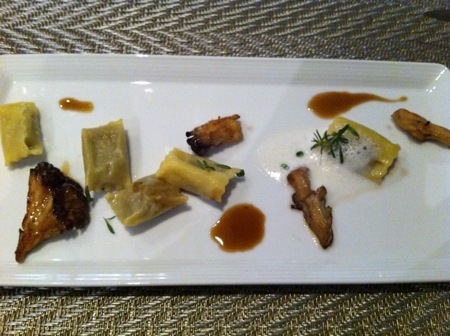 These eggplant-filled agnolotti and sautéed wild mushrooms with a milk foam convinced me that not all eggplant dished have to be watery mush. 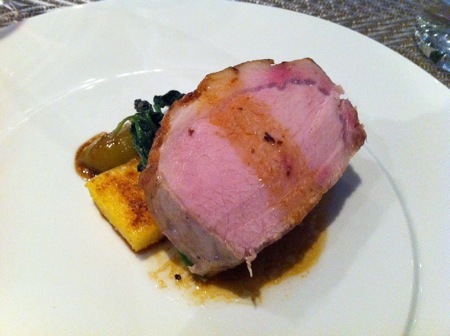 Although the pasta was vey light, the overall earthiness of the dish was an ideal transition to the final pork course. How can you go wrong with a perfectly roasted thick slice of pork loin? You can’t, not with this plate, which was accompanied by a slice of grilled polenta, some sautéed amaranth (a change from the spinach listed on the menu), a tomatillo, and pork jus. 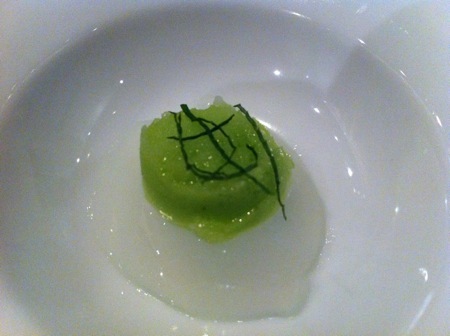 To clear our palates before dessert, we were presented with this bit of science from the kitchen: a gel made from tonic and Beefeater’s gin, with a spoonful of cucumber sorbet on top. Now that I know how to manipulate hydrocolloids, I’ll be stealing this idea. It’s not often that a dessert appeals to my inner science geek, but this plate managed to do that and be delicious as well. 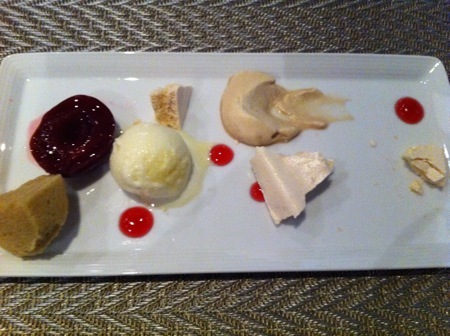 The stewed half plum was accompanied by four foams: solid meringue, solid steamed pudding, liquid coffee, and frozen kaffir lime/white chocolate ice cream. 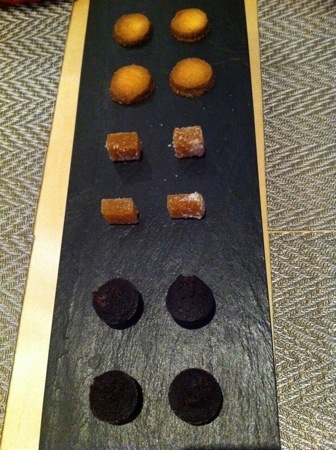 Our meal concluded with a few more sweet bites: miniature brownies, peach jellies, and shortbread biscuits. There wasn’t a suggested wine pairing to accompany the menu, so I chose a 2009 Gobelsburger Gobelsburger Grüner Veltliner for the first three courses, and a 2008 Roagna Dolcetto d’Alba for the pork and dessert. 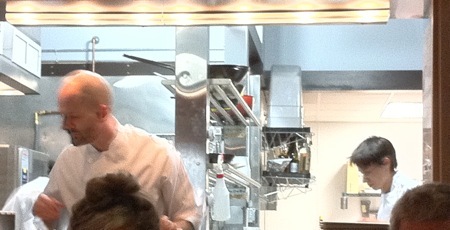 Did I mention I had a full view of the kitchen while I ate? The menu for the next few weeks will take advantage of more pieces of Lenin and Stalin; I was told that this week would feature shoulder and belly. I believe the overall plan is to change the main ingredient every month and run variations on it for for weeks. Although there have been references to having three-, five, and seven- course choices, we may have to wait for the seven-course menu. That will just give me another excuse to return to what could quickly become my favorite neighborhood restaurant. This entry was posted in food & cooking, local and tagged food, local. Bookmark the permalink.